Pioneer Ridge 5th grader, Paige Noth, was recognized for the Americanism Elementary School Poster Contest of Sons of the American Revolution. Noth’s poster won the PRMS contest, the Delaware Crossing Chapter contest and the Kansas Society contest. Her poster will be going to the National Congress of the National Society Sons of the American Revolution at Costa Mesa, California July 5-10 for the national contest. Paige was rewarded with a cash prize for the contest. Saturday, March 2, the GEHS Art Department entered the GFWC Art Competition. The competition was held at the Gardner Public Library. Many of the blue ribbon winners will be on display at the library through the month of March. Of the 70 pieces of artwork GEHS entered, they earned over 30 Blue Ribbons….and a best in show with a Van Gogh inspired painting done by senior, Long Vo. Congratulations to all the winners! 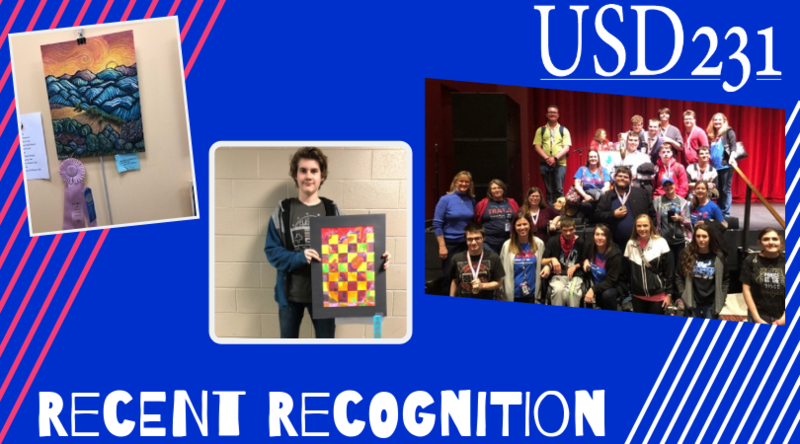 Wheatridge Middle School 8th grader, Jack Schroeter, recently had one of his art pieces selected to be exhibited in Topeka, Kansas. Each art teacher in Kansas could submit one piece of art for this exhibit which celebrates “Youth Art Month”. Youth Art Month is a nationally recognized month of promotion visual art and art education for grades k-12 in the United States. Every art teacher in the state may choose one piece of student artwork from the school they teach at. All artwork is original and can be either two dimensional or three dimensional. This year, over 130 pieces of art were turned in from Kansas. Way to go, Jack! The 25th anniversary of Job Olympics took place on March 28 at the Johnson County Community College. Students from the Gardner Edgerton High School TRAILS program and Transitions Program participated in many events.